Sisters of the Holy Family of Nazareth were honored by Catholic Charities of the Diocese of Tyler, TX on April 7 at the Garden of Charity event. Recognizing our sisters’ 80 years of service to families in East Texas, the event included a video presentation showing our sisters’ ministries at Mother Frances Hospital (now CHRISTUS Trinity Mother Frances Health System) through the last eight decades. Special guests included Bishop Joseph Strickland along with Srs. Barbara Jean Wojnicki, Catherine Fedewa, Consilia Mackiewicz, Irena Asztemborska, Kathleen Ann Stadler, Loretta Theresa Felici, Malgorzata Majszczyk, Marietta Osinska, Marta Gadzinowska, Michaela Tomkowiak, Monika Brulinska, Sylwia Kubiak and Teresa Mika. An exhibit of Catholic art, on loan from the Tyler Museum of Art, was also on display. Catholic Charities, the Diocese of Tyler and the entire East Texas community extend heart-felt thanks to the Sisters of the Holy Family of Nazareth for the love, hope and Sanctity of Life they have provided for 80 years in Tyler. 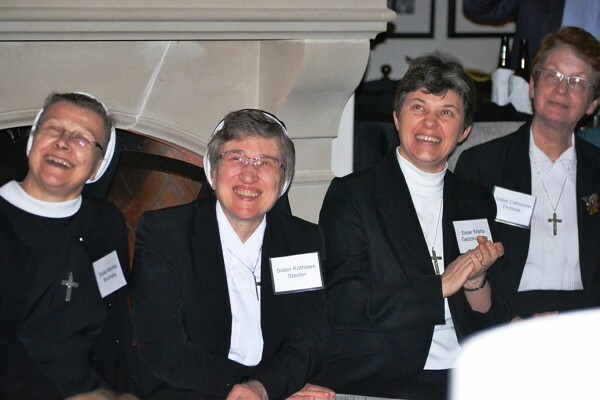 The Sisters are shining examples of Christ’s love and we are truly blessed by their presence. Thank you to Catholic Charities, the Diocese of Tyler and all of the sponsors of this event who helped recognize our commitment to creating communities of love and hope which celebrate the oneness of the human family.